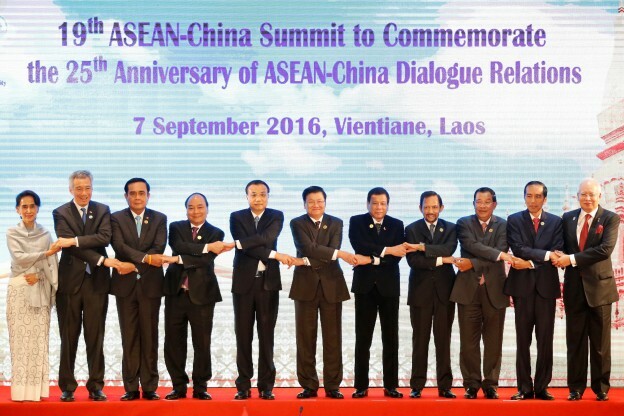 In a speech marking the 25th anniversary of the establishment of ASEAN-China dialogue relations earlier this month, Chinese premier Li Keqiang offered an unsurprisingly positive view of the relationship, praising both the “extraordinary path” the two sides had taken as well as the concrete measures they had agreed upon ranging from production capacity cooperation to a hotline for maritime emergencies amid lingering concerns on the South China Sea disputes. 1 Though these moves are by no means insignificant, Li’s speech also masks the deep uncertainty pervading many Southeast Asian countries about the path China is taking in the region as well as the diversity of responses to Beijing’s approach. Particularly since Xi Jinping’s ascension to power, China can be said to be employing what I would call a “push and pull” strategy towards Southeast Asia. That approach has two parts, often pursued together in a calibrated manner. On the one hand, Beijing has sought to incrementally “push” or advance its position on certain issues even at the expense of the interests of ASEAN states, with the clearest example of this being China’s assertiveness in the South China Sea disputes. On the other hand, China has sought to gradually “pull” Southeast Asian countries closer to its orbit by cultivating stronger, more formalized, and comprehensive relationships with them individually as well as collectively within ASEAN. Though the push and pull components often manifest themselves in alternating bouts of charm and coercion, they are in fact mutually reinforcing if calibrated effectively. The “pull” of China makes the benefits of engaging it clearer to the region and strengthens Beijing’s influence in ASEAN states, albeit to varying degrees. This makes Southeast Asian states think twice about challenging China when it undertakes an incremental push, and also allows Beijing to better absorb whatever short-term costs may result in its relationships. At the same time, every incremental “push” gradually shores up China’s position down the line and alters the status quo in its favor, further convincing ASEAN states that Beijing is on a slow but sure path to regional dominance and that they should give in to the “pull” of its growing might. The push-pull strategy also has the added utility of perpetuating divisions within ASEAN about how to deal with Beijing amidst these twin forces. The basic idea is that with time, an even stronger China will have both changed the status quo to be much more in its favor as well as drastically reduced the leverage of ASEAN states to do anything about it. Put differently, Beijing may well be calculating that its economic heft and military superiority in the region means that ASEAN states will eventually come to accept its regional dominance. At first glance, this strategy appears to be succeeding. Economically, a string of new Chinese regional and subregional initiatives, including the Asian Infrastructure Investment Bank (AIIB), the One Belt One Road (OBOR) and the Lancang-Mekong Cooperation Initiative, has made it harder for ASEAN states to resist the opportunities Beijing is offering. On the security side, China has been pushing the envelope on new forums, exchanges, and drills with individual countries as well as ASEAN as a bloc, covering areas such as law enforcement, cross-border crimes, counterterrorism, and even maritime security and the South China Sea.2 And as Li, the Chinese premier, outlined in his speech in Vientiane earlier this month, China is looking to deepen ties with ASEAN in areas like business and people-to-people ties, where it can leverage the presence of overseas Chinese that can further amplify Beijing’s influence. The reality is in fact much more mixed. Even as Beijing’s inroads into Southeast Asia over the past few years have been significant, Southeast Asian states also remember the fuller history of ASEAN-China relations, whether it be the Cold War decades where communist China was seen as an ideological and security threat by some, or the post-Cold War period where fears of growing economic competition and simmering territorial disputes still colored regional perceptions. This legacy of distrust still continues to inform how Southeast Asia views China. And though China today is able to pursue its ‘push and pull strategy’ in Southeast Asia with certain strengths – including its economic clout, diplomatic acumen, and military prowess – at times it has utilized them in ways that have resulted in more losses than gains, with unrealized investments and problematic projects, counterproductive strong-arming of certain governments, and alarming violations of sovereignty and territorial integrity. That can clearly be seen in how regional governments are responding to China’s strategy. For one, Southeast Asian states and their publics have begun to recognize that Beijing’s ‘pull’ often comes with considerable costs, and that they may be better served by a more diversified foreign policy, which includes engaging not only the United States, but other major powers like Japan, Australia, India, and the European Union. Officials from Myanmar privately admit that their overdependence on China was one of several factors that led to their country’s historic opening back in 2011. In landlocked Laos, this year’s ASEAN chair, though there has not been a comparably dramatic shift, there has nonetheless been rising dissatisfaction among some officials about the terms of Chinese infrastructure projects in the country. Indeed, some had read the leadership changes that occurred earlier this year in Laos in the quinquennial party congress8—including the sidelining of the ethnic Chinese deputy prime minister Somsavat Lengsavad who played a key role in bringing Chinese investors into the country—as signaling a more cautious line on Beijing’s economic influence. In Malaysia, China’s largest trading partner in ASEAN, the country’s Prime Minister, Najib Razak, continues to view a good economic relationship with Beijing as a key priority. But among some in government as well as in the opposition and the elite, there are growing anxieties about whether Beijing’s rising influence is undermining the country’s sovereignty and autonomy.9 Of particular concern is China’s purchase of government securities or assets from sensitive entities like 1Malaysia Development Berhad (1MDB)—a beleaguered state fund linked to a massive corruption scandal implicating Najib himself. With Malaysia’s (and Najib’s) fate being tied so closely to China, some have wondered both publicly and privately whether the country will be able to push back against Beijing on certain issues. A series of diplomatic incidents that have rocked Sino-Malaysian relations over the past few years—most notably China’s criticism of Malaysia’s handling of the missing Beijing-bound Malaysian Airlines flight MH370 in 2013 and alleged interference by the Chinese envoy in the Southeast Asian state’s internal affairs after remarks made ahead of a pro-government rally in a predominantly ethnic Chinese district in 201410—have only compounded these worries. In other cases, Southeast Asian responses to Chinese “pushes” have been subtler but equally significant. Take, for instance, Indonesia, the largest country in ASEAN and traditionally considered the “first among equals” within the grouping. Though Jakarta has felt the effects of China’s growing assertiveness in the South China Sea – from run-ins with Chinese vessels to threats from Beijing to stay silent on the issue – President Joko “Jokowi” Widodo along with several influential cabinet officials have still been reluctant to say “no” to economic overtures from Beijing, since they are key to realizing domestic priorities including infrastructure development. Nonetheless, signals on the security side—from Indonesia’s stepped up presence in the resource-rich Natuna Islands to the military’s still cool reaction to Beijing’s proposed defense overtures— are pretty clear demonstrations of how Jakarta is resisting Beijing. Even Singapore, long praised for its deftness in balancing various powers, has not been spared from pressure from Beijing and has had to respond in kind. As the current coordinator of the ASEAN-China dialogue partnership, China has been leaning heavily on the city-state privately and publicly to help promote better ties between the two sides and depart from what Beijing perceives as its pro-US stance, which, in any case, is far beyond the facilitator role that the position actually calls for. Though a quick look at the headlines and the rhetoric coming out of Beijing and some ASEAN capitals may suggest that the subregion is accommodating China’s rise and bandwagoning with it in the face of the Asian giant’s push-and-pull strategy for regional dominance, a closer examination reveals a more complex reality. Even as all Southeast Asian states remain hesitant about saying “no” to engagement with China, every single one is also both maximizing the benefits of Beijing’s rise while at the same time minimizing the actual or potential risks to varying degrees, including by resisting some Chinese actions that run against their own interests, building up their own capabilities and strengthening ties with other countries. That is far from surprising. It is in line with Southeast Asian states’ checkered history with China and their preference for balancing major powers rather than placing all their eggs in one basket. The key question, though, is whether the region’s response to China’s push-and-pull strategy for regional dominance will be sufficient to disabuse Beijing of the notion that its path to primacy is inevitable and that time is on its side, with every Southeast Asian state eventually being forced to accept this reality. For now, China’s continued pursuit of its approach in spite of the limited resistance it has encountered from individual Southeast Asian states as well as ASEAN as a bloc suggests that this is not the case. Prashanth Parameswaran is Associate Editor at The Diplomat Magazine and PhD candidate at the Fletcher School of Law and Diplomacy at Tufts University. Follow him on Twitter @TheAsianist. 2. Prashanth Parameswaran, “Beware the Illusion of China-ASEAN South China Sea Breakthroughs,” The Diplomat, August 17, 2016. 3. Prashanth Parameswaran , “Exclusive: Managing the Strained US-Thailand Alliance,” The Diplomat, December 16, 2016. 4. Prashanth Parameswaran, “The real danger of Rodrigo Duterte,” The Straits Times, September 22, 2016. 5. Prashanth Parameswaran, “The danger of Duterte’s China and South China Sea approach,” Rappler, July 8, 2016. 6. Prashanth Parameswaran, “U.S. South China Sea policy after the ruling: Opportunities and challenges,” Brookings, July 22, 2016. 7. Prashanth Parameswaran, “Does ASEAN Have a South China Sea Position?” The Diplomat, March 26, 2015. 8. Prashanth Parameswaran, “Laos in the ASEAN Spotlight: Opportunities and Challenges,” The Diplomat, July 23, 2016. 9. Prashanth Parameswaran, Malaysia’s Approach to the South China Sea and Implications for the United States, (Center for New America Security, 2015). 10. Prashanth Parameswaran, “The Truth About China’s ‘Interference’ in Malaysia’s Politics,” The Diplomat, October 2, 2015. 11. Prashanth Parameswaran, “US-Vietnam Defense Relations: Problems and Prospects,” The Diplomat, May 27, 2016. 12. Prashanth Parameswaran, “Exclusive: China’s South China Sea Statement That Divided ASEAN,” The Diplomat, June 23, 2016. 13. Prashanth Parameswaran, “What Really Happened at the ASEAN-China Special Kunming Meeting,” The Diplomat, June 21, 2016. 14. Prashanth Parameswaran, “Strengthening US-Singapore Strategic Partnership: Opportunities and Challenges,” RSIS Commentary. They also remember the Asian Financial Crisis, when the only country that stood by them was China, which refused to devalue the RMB and provided loans to save them from bankruptcy. More recently, they remember China running trade deficits with all of them.